Did you know that there is a Chili Pepper Institute? It’s true! At New Mexico State University, where the institute resides, the Big Jim Chili Pepper was developed in the 1970s. The Guinness Book records this pepper as one of the largest chilies measuring in at a whopping 12 inches! But if you prefer to just eat it, the green to red pepper is relatively mild with a medium heat rating that won’t leave you on fire. Don’t worry though, it still has that great chili flavor. Being sensitive to the cold, planting should be delayed until the danger of frost is past in the spring. Ideal temperatures are 70 to 80 degrees F during the day, and 60 to 70 degrees F at night. Usually, the plants set satisfactory crops when temperatures are between 65 and 80 degrees F and the soil is well-supplied with moisture. Avoid a soggy, water-logged soil condition when growing peppers. Outstanding Features: Disease resistant and easy to grow. 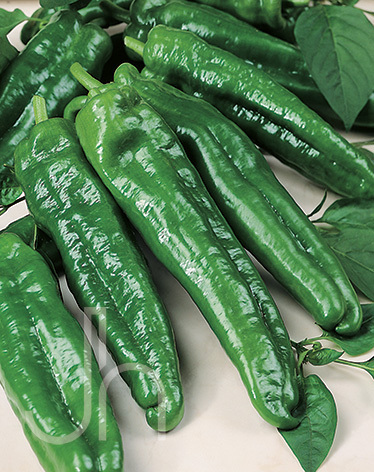 Click here to buy Big Jim Chili Peppers direct from www.buygardenvegetables.com. I LOVE the Big Jim. I first had it visiting a friend in NM. WOW – almost the perfect pepper between heat and taste. I have grown them the past few years here in Ohio. The weather is usually hot enough to produce some good crops and enough to preserve to use over the winter. This year – ugh! Very cold even by our standards. Does anyone know of anyone/anyplace I can mail order them from? I would love to get a bushel of them shipped – Fed Ex no problem. I-net searches are iffy at best so far. Any suggestions? Thanks for visiting our website. A lot of people have had problems producing a good garden this year with the weather. Here in Arkansas we had problems with tomatoes and sweet corn due to lots of rain. I am not aware of anywhere that you can order Big Jim peppers and have them shipped to you. I will keep my eye open for you though.